The Q3 Academies Trust is committed to educating the whole child, underpinned by Christian values. 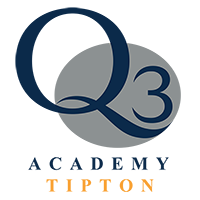 Our name “Q3” embodies our ethos: to search for that which is good, right, and true. The Q3 Family currently has two Academies in the Trust: Q3 Great Barr and Q3 Langley; both Academies are vibrant and exciting places to learn and grow, where we strive for excellence in all that we do. There is a relentless focus on high quality teaching and enrichment opportunities for every young person who joins the Q3 Academies Trust; we are determined to give our children the very best start in life. Our Academic achievements are impressive, and to support this we focus on character development and have high expectations of behaviour. Pastoral care is exceptional and the excellent relationships are a striking feature of our work, as we help students to develop mutual respect, empathy, and care for others. We recognise that education is also about nurturing talent and every young person is encouraged to engage in the wide range of activities on offer across the Q3 Academies Trust. We have an outstanding team of staff who work tirelessly to challenge every student to be the ‘best’. They encourage creative thinking, designing learning to engage and inspire all students. Our Sponsor and Governors are committed to supporting staff in providing the highest quality learning experience for every young person who joins us. Strong, collaborative partnerships with our parents and carers contribute to the on-going success of their children. This relationship begins before entry to Year 7 to ensure a smooth and seamless transition. We have exceptionally high expectations of our young people. When they leave our Academies we are determined that they will have the qualities, academic success, and interests that will enable them to enjoy a successful and enriched life. I am very privileged to be the Chief Executive and I give you my personal commitment to ensuring that ‘No child is left behind‘. I look forward to welcoming you to our Academies.